Liaquat Ahamed was born in Kenya. He was educated at Trinity College, Cambridge, and at Harvard University where he got a degree in Economics. He has been a professional investment manager for more than twenty five years. Ahamed has worked at the World Bank and he was the chief executive of Fischer Francis Trees and Watts in New York. Currently Liaquat Ahamed works as adviser for hedge funds, as a director of Aspen Insurance Company and he is on the board of trustees of the Brookings Institution. 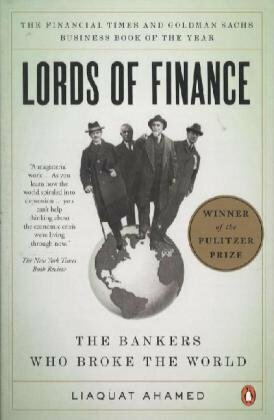 Lords of Finance won the 2010 Pulitzer prize for history and several prizes more like Financial Times and Goldman Sachs Business Book of the Year in 2009 or the 2010 Spear’s Book Award as Financial History Book of the Year. Cicero said to be ignorant of what occurred before you were born is to remain always a child. For what is the worth of human life, unless it is woven into the life of our ancestors by the records of history? Reading this book you can see some of the obvious parallels from the 1920s and 1930s and the current crisis. This is the reason why I recommend reading this book, a way to understand what it is happen nowadays in the world. Ahmed explains how was produced the world economic collapse of 1929 to 1933. For him, It was the direct result of a series of misjudgments by economic policy makers. The first culprits were the politicians who presided over the Paris Peace Conference after the Great First War and the gigantic international debts which were signed for its reparations. Those debts left massive fault lines in the world financial system, which cracked at the first pressure. Benjamin Strong, Governor of the Federal Reserve Bank of New York (since 1914 until his death in 1928) succeeded by George Harrison. Montagu Norman, (close friend of Strong) was the Governor of the Bank of England from 1920 to 1944. Émile Moreau, Governorof the Bank of France from 1926 to 1930. And finally Hjalmar Schacht, President of the Reichsbank from 1923 to 1930 and from 1933 to 1939. The biggest error, even more than the war reparations amount, the worst step that the financial makers of the world took was the decision to take the world back into the gold standard. Reading this book, you will be able to learn lots of things about economic and financial history that it will help you to understand what it is happening currently in the world. Esta entrada fue publicada en ARTICLES IN ENGLISH, En color salmón y etiquetada 2010 Pulitzer prize, Émile Moreau, Benjamin Strong, Business Book of the Year, David Torija, gold standard, Hjalmar Schacht, Liaquat Ahamed, Lords of Finance, Montagu Norman, Penguin Books, The Bankers Who Broke the World. Guarda el enlace permanente.